I am sure that even those who are not familiar with yoga know of kapalabhati thanks to one god man on the television doing heavy duty abdominal contractions. Kapala means forehead and bhati means illuminated. Kapalabhati, therefore, is an exercise that brings illumination to your whole face. Sit in a comfortable position – either in sukhasana or with your shins tucked under your thighs or on a chair with the feet firmly planted on the ground. Place your palms on the knees, facing downward. When you are starting off, you can place your palm on the lower belly so that you can be more aware of how your abdomen is moving. Inhalation occurs in a deep breath. Your abdomen rises when you inhale. Now exhale really quickly, sending out the air in a burst from the nostrils and constricting your abdomen as you do so. Now start repeating this at a quick pace. When you do so, the inhalation does not remain deep, but is passive and involuntary, to take in air. What you need to focus on is the quick exhalations. Feel your abdominal muscles contracting when you do so. Continue for ten such sets. After that take a few regular deep breaths. Until you get a hang of how it is done, do not push your body to do too many of these rounds, it can induce a headache. But once you are comfortable doing it, up the count to about 60 contractions in a minute. With more practice, you can even go upto 90 contractions a minute. 1. 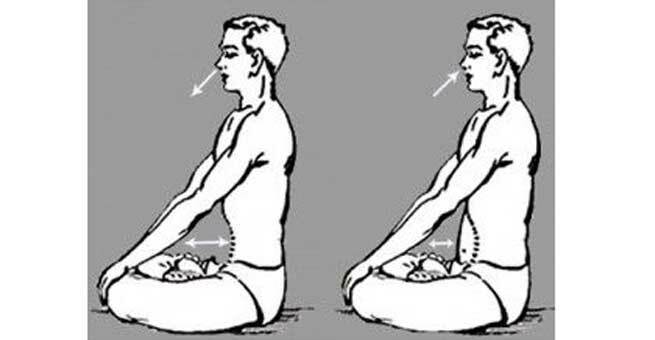 The most important benefit of Kapalabhati Pranayama is that it helps tone up the abdominal muscles. You can feel your stomach fat burning away over a period of time if you practise Kapalabhati diligently. 2. It also helps boost your immunity since it works up the respiratory, circulatory and the digestive systems. 3. The forceful exhalation helps in clearing out all the respiratory passages and prevents any infections from occurring. 4. The diaphragm is exercised in this kriya and this improves the flexibility of the diaphragm. 5. It also improves the lungs ability to pump air into the body. 6. The constant focus on the breath improves your concentration and mental abilities. 1. Since you are overworking your circulatory system in this kriya, it can lead to hypertension, heart problems and hernia. 2. A short inhalation and the forceful exhalation, when repeated can lead to dizziness or headaches in many. First, perform Kapalabhati in the presence of a qualified yoga practitioner in order to ensure that you are not doing it wrong. It should not be practised by pregnant and menstruating women. Patients suffering from high BP should refrain from doing Kapalabhati. Ensure that you do it in empty stomach. It can be done at any time in the day except after evening. If you are very weak and feel dizzy after performing Kapalabhati, discontinue for a while. Do not do unrealistic counts like 200 a day initially. Start small and slowly build until you reach a number that will keep you pepped up.